PHILADELPHIA - The UConn women’s basketball team will have a different look and different feel to it as it prepares for the new season. The Huskies, who have won all 101 games they have played against American Athletic Conference competition since the league’s formation five years ago, were the unanimous selection to win the 2018-19 AAC championship in the coaches preseason poll released this morning. UConn senior All-American Katie Lou Samuelson, the two-time reigning AAC Player of the Year, was the choice for the preseason award. Samuelson was joined on the preseason first team by her teammates senior Napheesa Collier and junior Crystal Dangerfield, South Florida senior Kitija Laksa, and Houston junior Jasmyne Harris. Samuelson, Collier, and Laksa - who were first-team picks after last season - were unanimous selections. UConn returns three starters from last season’s 36-1 club that swept the AAC regular season and tournament titles. 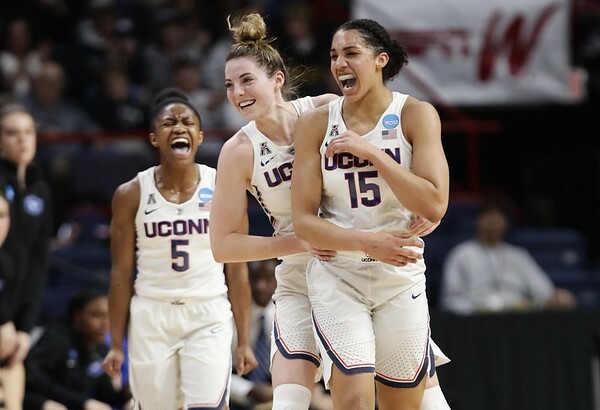 The Huskies advanced to 11th consecutive NCAA Final Four before suffering a two-point overtime loss in the national semifinals for the second year in a row, this time to Notre Dame. In 32 games as a junior, Samuelson averaged 17.4 points and career-highs of 4.5 rebounds and 3.8 assists. She was the only AAC player to rank in the top 10 in field-goal percentage (53.0), 3-point percentage (a nation’s best 47.5) and free-throw percentage (83.5). The Huntington Beach, California, native missed four November contests with a left foot sprain. She hurt her left ankle in her first game back against Notre Dame on Dec. 3 and aggravated the injury on Jan. 18 against Tulsa. She missed the game at Temple three days later and played the rest of the season with a brace. On April 12, Samuelson had surgery to repair shredded lateral ligaments and a torn tendon in the ankle. Her rehabilitation kept her out for the spring and summer, but allowed her to grow into a leadership role. She is practicing and on track to be 100 percent for the season opener in four weeks. She is 288 points shy of becoming the 10th member of UConn’s 2,000-point club. Collier, the 2017 AAC Co-Player of the Year with Samuelson, ranked in the AAC’s top 15 in scoring (ninth at 16.1 points), rebounds (seventh at 7.4), assists (15th at a career high 3.3), assist-to-turnover ratio (fifth at 2.2), field-goal percentage (fifth at 58.3), free-throw percentage (eighth at 78.6), steals (14th at 1.6) and blocks (third at 1.7), as a junior. In five NCAA Tournament games, she averaged 20.8 points on 67.7 percent shooting, 7.2 rebounds and 4.0 assists and earned her a spot on the all-Final Four team. She enters her senior year with 1,609 points and 808 rebounds and is on pace to become the fourth UConn player with 2,000 points and 1,000 rebounds. Last month, the St. Charles, Missouri, resident was a finalist for the United States senior national team that took part in the FIBA World Cup. In 35 games as a sophomore, Dangerfield averaged 9.5 points and 4.1 assists though she played much of the season with shin splints. She ranked fourth in the AAC in assists, third in assist-to-turnover ratio (2.7), and second in 3-point shooting percentage (44.9). She was selected to the all-AAC second team and to the AAC and the NCAA Albany Regional all-tournament teams. USF was the unanimous choice for second in the coaches poll with 111 points and received Auriemma’s first-place vote (coaches cannot vote for their own team). The Bulls were followed by Houston (95 points), Central Florida (92), Cincinnati (74), Temple (72), SMU (55), East Carolina (46), Tulane (42), Wichita State (35), Memphis (25), and Tulsa (24). Named to the preseason second team were fifth-year seniors Laura Ferreira of USF, Alliyah Butts of Temple, and Alicia Froling of SMU, Houston junior Angela Harris, and Temple sophomore Mia Davis. Butts and Froling missed last season after knee surgery while Ferreira was a medical redshirt two years ago. UConn’s AAC opener is Jan. 6 at Houston. The AAC tournament is March 8-11 at Mohegan Sun Arena. Posted in Newington Town Crier, UConn on Monday, 15 October 2018 17:16. Updated: Monday, 15 October 2018 17:18.